March was an incredibly hard month because there were five weeks. 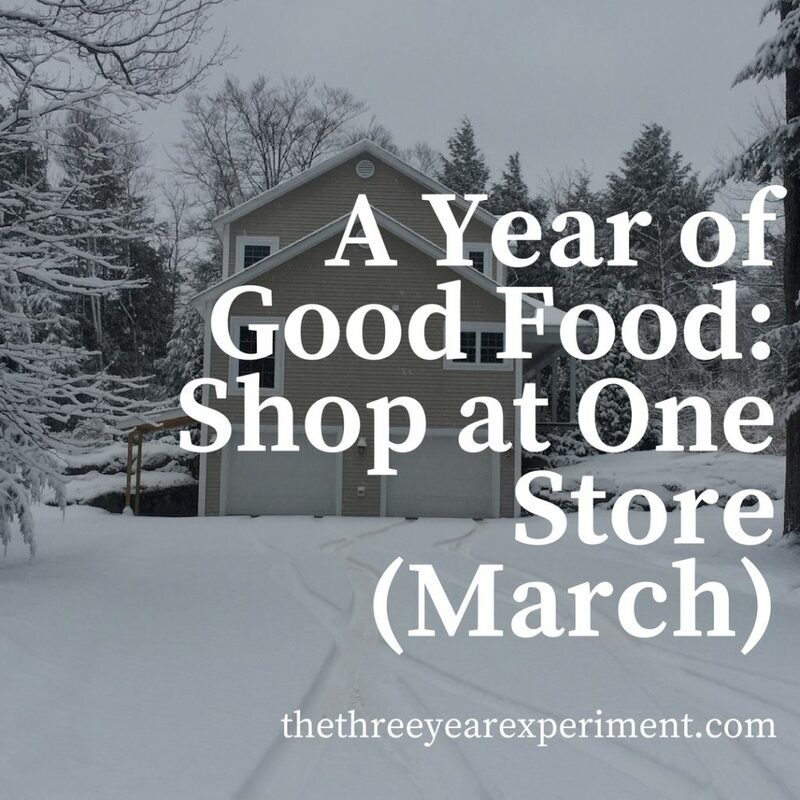 We ended up keeping our grocery spending around $100 per week, but we kept running out of food. Spending $100 per week doesn’t allow us to buy everything we need for a week’s worth of groceries. We also spent way more in eating out this month, which I think was a result of us getting frustrated with not having food in the house. We did shop at Aldi once this month, which was amazing! I miss that store so much. We were at a school event for the boys, about an hour away from our house, and there’s an Aldi there. We got so much delicious food for $40. Because I took cash out for the first half of the month, I don’t remember exactly what I spent at the grocery store, but I remember keeping it very close to $100. 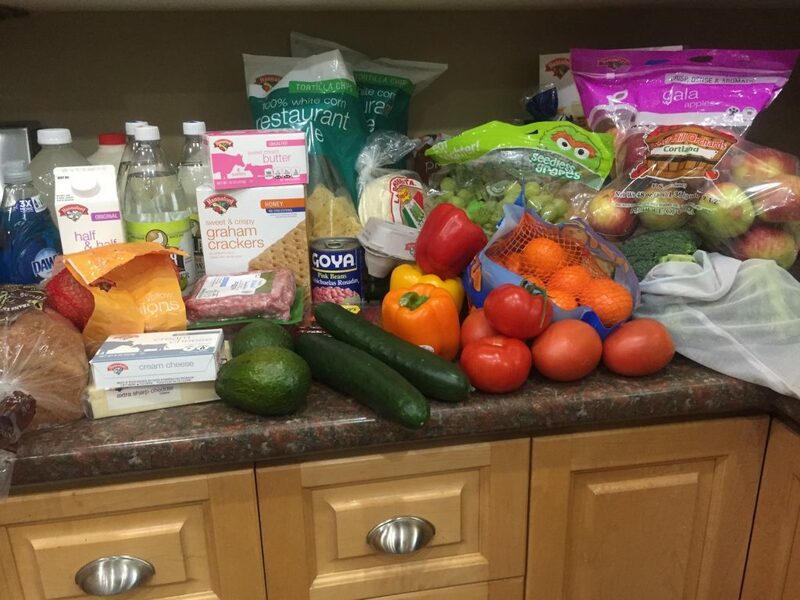 Week one’s grocery haul, and the only week of groceries I took a picture of this month. For us, at Hannaford, which is a middle-of-the-road grocery store, to keep our grocery bill at around $100, I have to be very careful with what I buy. I might be able to buy a meat or two, but I definitely have to pick and choose for everything else. This week, we ran out of snacks pretty quickly (and we snack a lot in our family, on fruit, crackers, and tortilla chips). I cleaned out the pantry this week. Notice our plethora of snacks. 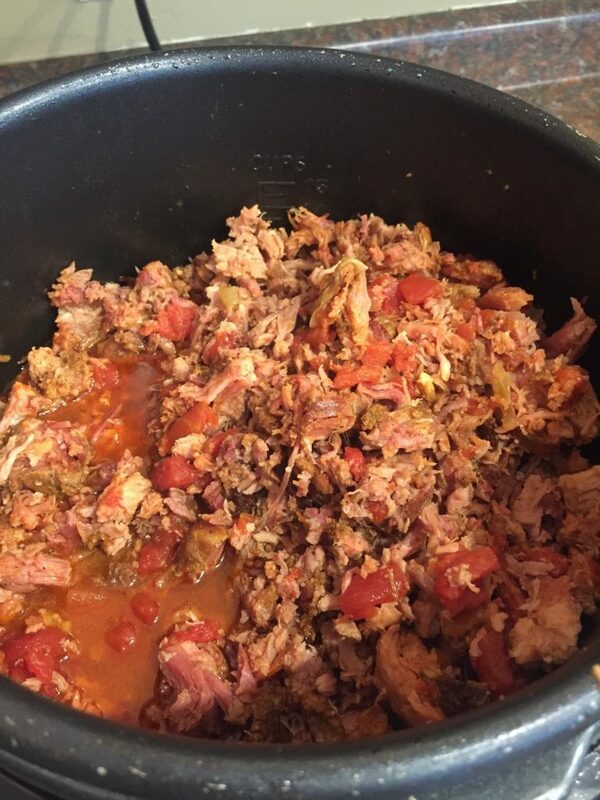 Chopped pork that we made into a bunch of different delicious BBQ meals. I bought a lot of snacks in preparation for the kids’ Destination Imagination competition (if you don’t know what that is check it out–the best after-school activity for kids, IMHO). Then, we went to Aldi in a nearby town and got milk ($1.50! ), eggs ($.89! ), tortilla chips ($1.40 a bag! ), some other random stuff, and fresh salmon ($8 a pound). I was almost tempted to drive back to that Aldi the following week. Sigh. Homemade curry we made this week. 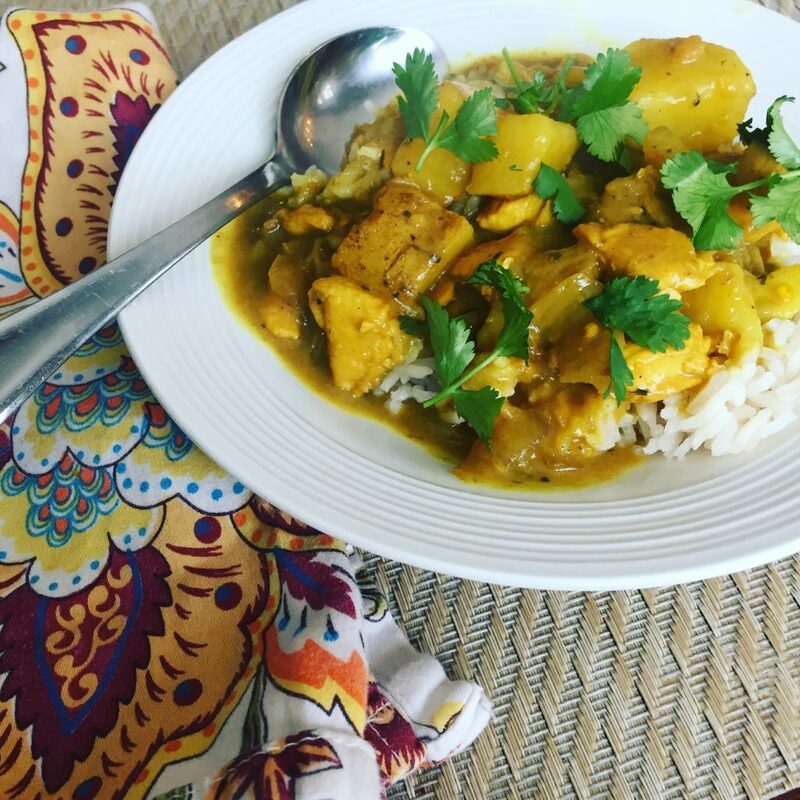 Homemade curry is so superior to store-bought (and of course, less expensive). My co-worker was eating these leftovers in the lunchroom and they smelled amazing, so he was nice enough to pass along the recipe. This yellow curry is homemade! And it’s not difficult at all-basically, you roast some veggies for 45 minutes, then blend them with some spices in the food processor. Makes enough for 4 dishes. This included ingredients for our Easter dinner. 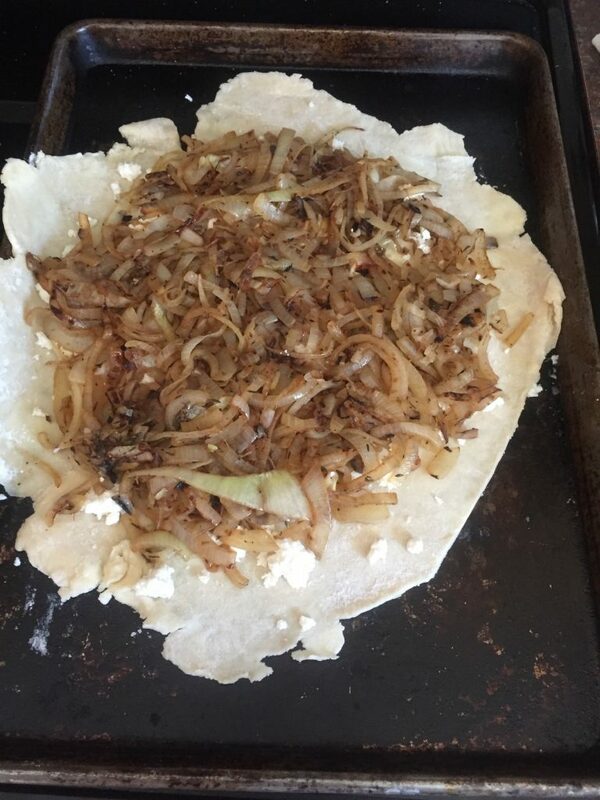 The only thing I photographed of that was the beginning of this really good onion tart I made. 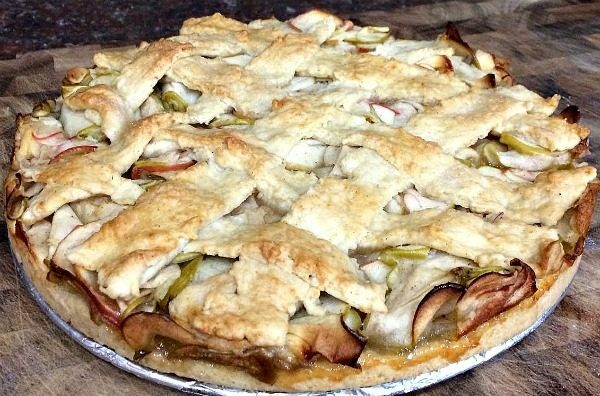 The caramelized onion tart I made for Easter dinner. Random trips to our local market: 8ish. Total money spent there: approx. $82.23. It’s hard to tell since half the month I used cash. I remember making one or two trips to our local mart, which I call $10 spent. The rest Mr. ThreeYear or I put on credit cards. $100 per week budget means that we end up with very little food at the end of the week, which means the kids buy lunch at school, we eat out, etc. It’s better to spend around $150 a week at the store, at least in our area. Shopping with cash was enlightening in a lot of ways. Although I didn’t save receipts and therefore have shoddy records, reaching for cash every time I went to the store definitely made me think harder about what I was buying. It also helped me see how much I had left to spend. I took out $360 for the first half of the month. I spent that in three weeks, but on the third week I ran out of money and used my card. I didn’t take out cash for the rest of the month, mainly because of laziness (driving by the bank is a pain because it’s very out of the way). I may try the experiment again next month, but I’ll probably take all the cash out at once, even if I don’t carry it all around with me, just to avoid multiple trips to the bank. I think that for the first half of the month I made a lot less random trips to the store, and if I did, I just made sure it fit in the budget. April’s focus is going to be Go to the Same Store Each Week. We pretty much did this last month. I’m going to shop at our local store, Hannaford, because we can get everything we need there. It’s not necessarily cheaper, but they have started a grocery reward program so we can earn 2% back on their store brand items each quarter. By going to the same store each week, I’m going to try and get into a routine so that it makes it easier to get in and out faster, and so I won’t be tempted by random, unplanned purchases. It will also make it easier to find deals like that chicken. How did you do with food spending in March? Was it easier or harder than February? I am jealous. I like your idea of the 5-week grocery budget. It makes much more sense. I may adopt that for next year. Can’t believe your little guy is another year older! Time flies. I never heard of Hannaford before – you just live very far away from us in the NW. $100 doesn’t sounds like a lot of food for a family of 4! $150 looks like the sweet number. For me alone I eat no more than $40/week so if you x4 it works out to be very reasonable, similar ballpark. Thanks Lily. That actually makes me feel so good, coming from someone who keeps her grocery spending so low! Man oh man. I live far away in distance and so many other ways. New England is a whole other weird little world (New Englanders won’t like that but it’s true!). Are you guys getting any sunshine up in Seattle these days? Going to the same store helps so much. I used to really get nervous that I was missing out on loss leaders (I am! ), but I could never go in a store for just one promo. Aldi it is! I agree–it ends up sapping so much time and energy that it really isn’t worth it for me. Still dreaming of all those discounts. I may break down and go down to Aldi again and do a stock up! Love this series! Food remains my largest budget category, though I’ve cut monthly spending by nearly half this year, after “getting serious” about it. I continue to prioritize healthy, delicious food – which is the foundation of, well, health! But there are so many ways to cut spending while eating healthy. I do find food costs here in BC, Canada, are substantially more than anywhere I lived in the States. But we do have tons of cheaper, local produce in my town, once the farmer’s markets open for the season. Thanks for continuing to inspire my budget-cutting efforts! Dana, I can believe it! It was shocking how expensive food was when we moved to New Hampshire from Atlanta. That’s great that the farmer’s markets have such cheap options. Our farmer’s markets are way more expensive, but we still visit them because the produce is so delicious and we want to support our local farmers. That’s pretty impressive that you’ve cut down by almost 50% Cutting 20% has been a sustained, totally focused effort for us and I feel like if we stop paying attention, we’ll go right back up. One of our goals as we shop is to fill most of the cart with fruits and veggies and make other food an accompaniment to that. My children can go through so much fruit! This Saturday, I bought a bag of clementines, a bag of apples, a bunch of bananas, six plums, and it’s all. gone. today. When they get to be teenagers, I’m done for. Your pantry looks awesome, BTW. 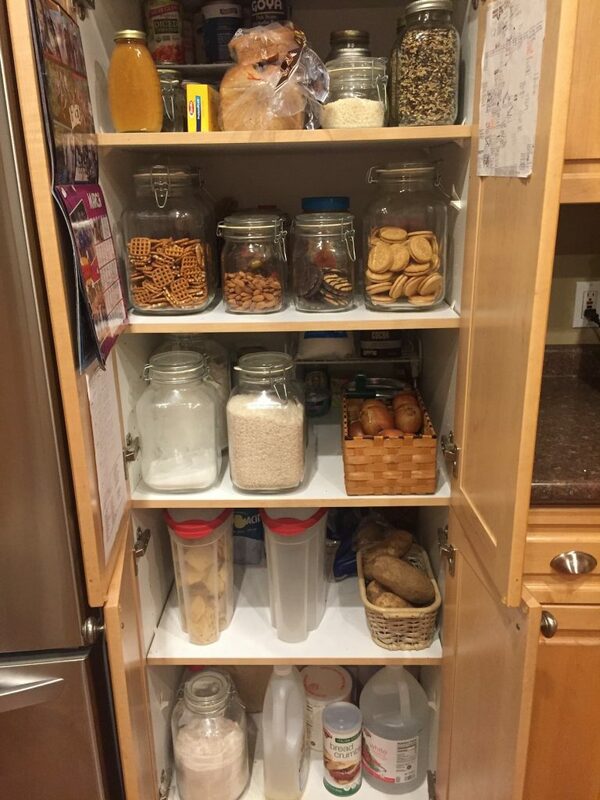 I hope I can keep my pantry clean and organized like that when we move to our new house. I don’t have one here. I think the pantry is the thing I am most excited about, to be honest. Ha. What I really wanted to comment about though, is the fact that your Aldi only charges .89 cents for eggs! When I first started shopping there, that’s about what they cost. That stayed for a few weeks and every since then for months now they have been over $1.00. Usually they are up around $1.20 or even higher as of late. I wonder why there is a such a difference in price? Thanks! It looked like that for two days and now looks normal. Ha! 🙂 You know, I’ve noticed that about Aldi in the past. Sometimes, in Atlanta, prices would be lower, then inexplicably higher for milk. I have no idea! I guess there are supply issues? But in general, even $1.20 is way lower than my normal grocery store where they charge $1.89 for a dozen of plain white eggs.